The first day of fall classes in Auburn is always exciting. New freshmen are nervous about their academic challenges but excited to be on their own for the first time. Upperclassmen are meeting up with old friends and settling into their new fall digs. Everyone is anticipating the start of football season. It’s just an exciting time to be on campus, as our readers well know. 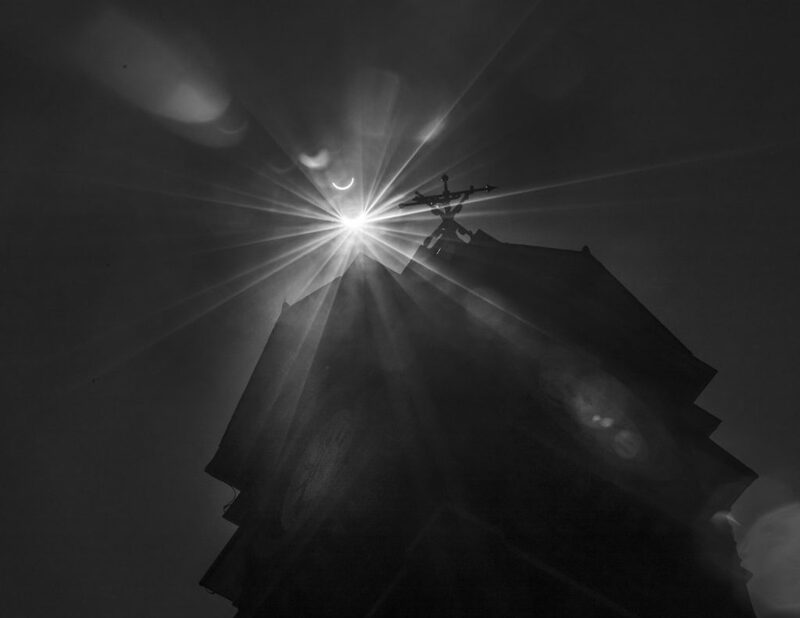 But this year, on August 21, the first day of classes coincided with the full solar eclipse. The excitement that spread across the entire country was very much felt here on the Plains. It’s hard to explain but there was just something extra in the air. Everyone was out, and we mean everyone. People were laughing and sharing eclipse glasses. Others were demonstrating their solar reflecting models for all to see. For a few moments, we even enjoyed a brief respite from the blistering heat that had gripped Auburn and the South for way too long. That rare “noon moon” just had a way of cooling things down and bringing people together. 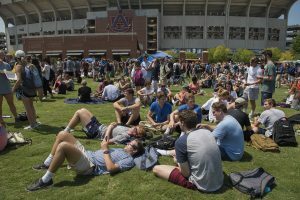 There were scheduled events on the Green Space beside the new Student Union Building across from Jordan Hare Stadium. Hundreds of people were out there. The Haley Center concourse was packed. Faculty, staff, and students were all over Ag Hill. Students emerged from the spectacular new Mell Classroom Building and Ralph Brown Draughon Library, looking westward. It was just a liberating moment with a positive, sharing vibe in the air. 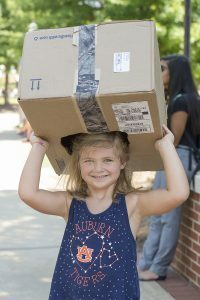 Many of us have been around Auburn a long time – and we mean a long time, going back to the quarter system and standing in line for Drop and Add – but we had never really seen or felt anything like this before. 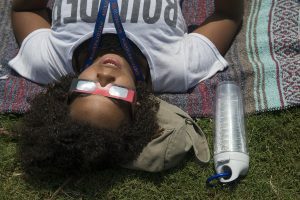 August 21, the first day of 2017 fall classes, was a day that will long be remembered by anyone who was there … especially that brief space in time when the eclipse peaked at 1:36 pm CST, and a crescent shadow covered the campus and the people who belong to that campus, and we all shared a magic moment that was uniquely Auburn.